If you were a freedom-loving U.S. American in the mid-1990s, you surely remember the tense (and, in retrospect, patently ridiculous) battle for college rock supremacy between Hootie and the Blowfish and the Dave Matthews Band. It was a conflict that threatened to tear a nation of khaki-shorted collegians apart solely on the relative merits of "Let Her Cry" and "Don't Drink the Water." Now, imagine that same battle with way better music, far more drunken publicity interviews, and much bigger stakes (namely, the victorious band getting to define the cultural values of its nation and hobnob with the head of state; can you imagine Darius Rucker hanging out with Bill Clinton?). That, in a nutshell, was the Battle of Britpop (ca. 1993-1997) waged between Blur, a group of erudite, post-mod schoolboys, and Oasis, a band seemingly motivated only by the prospect of fame and their disdain for their fellow bandmates. To make a long story short, Oasis won the battle but Blur won the war. It was a seminal moment in the type of British rock history that only the British can truly comprehend. However, both bands had notable Stateside success during this period (even if Blur's biggest hit mostly consisted of Damon Albarn yelling "Woo hoo!" at the top of his lungs), ushering a brief cultural fad known as "Cool Britannia." The invasion was brief but influential, reminding Americans that there was life after grunge and introducing Yanks to a previously unseen side of British youth culture with a distinct nationalist flair. The Britpop influence was so pervasive by '97 that even its demise came from within, headed by the unlikely tag team of Radiohead and the Spice Girls. Ten years later, there's a distinct feeling of deja vu. Radiohead is more relevant than ever. The Spice Girls are touring again. Beckhamania has gripped the Los Angeles elite. And many a band that entrances the hipster audience hails from Britain--they just typically specialize in dance-punk or art-rock nowadays. 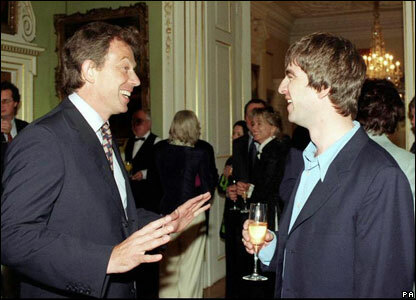 Britpop, it seems, is as dated as Noel Gallagher's bowl cut and Union Jack-emblazoned guitar. America's embrace of music steeped in English esoterica hasn't endured quite as long as its fascination with music based on Lewis Carroll-esque nonsense words like "zigazig-ah." But in the UK, where a fierce loyalty to the product of native musicians remains, Britpop isn't quite dead yet. Even Oasis is still charting. Some of the neo-Britpop vanguard has made fleeting advances towards American chart success but hasn't gotten much farther than The O.C. soundtrack (a la Kaiser Chiefs). Razorlight, in its distinctly cheeky fashion, even penned a breezy single entitled "America" for its most recent album, only to see it gain far greater notoriety in the UK. Americans' tolerance for references to "old Leodiensians" and ebullient shouting of 12-digit mobile phone numbers only extends so far, I guess. The Queen doesn't need any more saving. God save Britpop instead. "THE DEATH OF OINK, THE BIRTH OF DISSENT, AND A BRIEF HISTORY OF RECORD INDUSTRY SUICIDE."